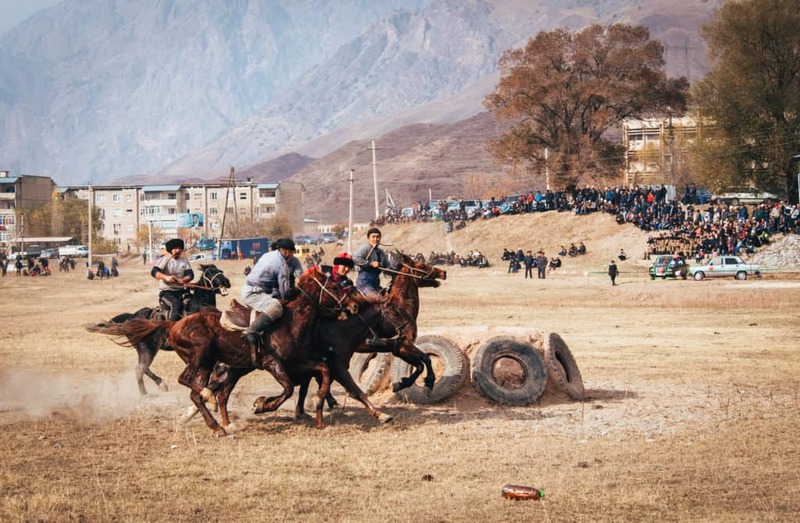 This photo-essay is an insight into Kok Boru, an unusual and popular horse game in Kyrgyzstan and Central Asia, including information on where you can see it in Kyrgyzstan. 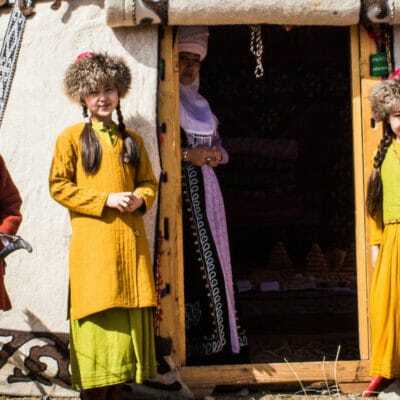 Where is the best place to see Kok Boru in Kyrgyzstan? 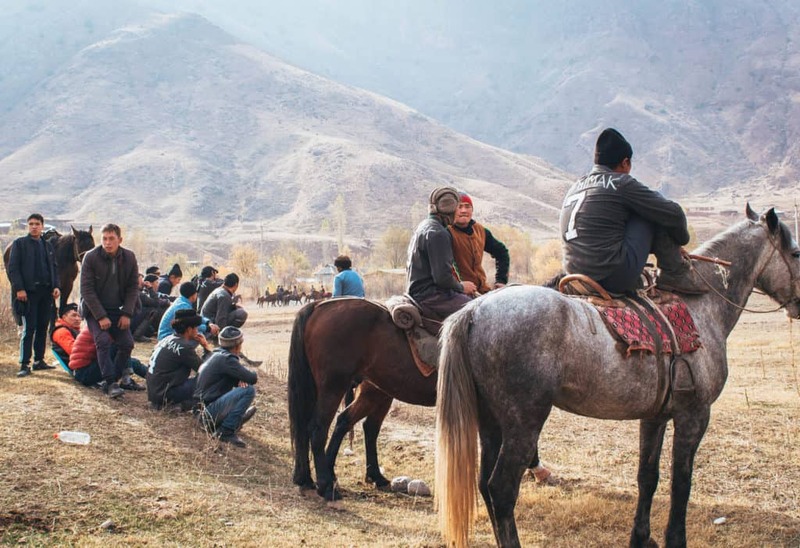 Horses have always played an essential role in the lives of the Central Asian nomads. 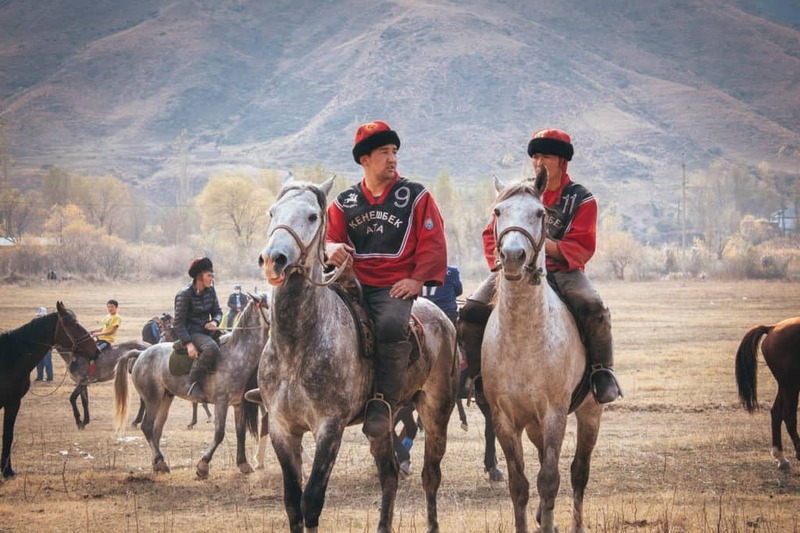 They were the first people in the world to learn the skill of horseback riding. 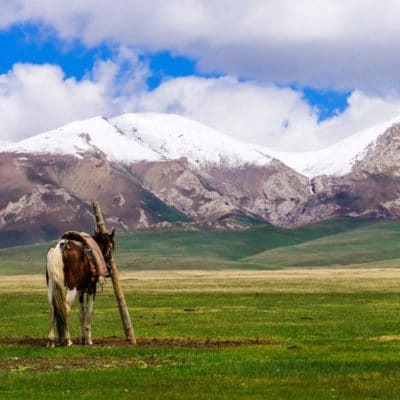 The nomads practically lived on their saddles while roaming the endless steppes and their children learned how to ride horses before they could barely walk. The horse was an indispensable helper and loyal companion that enabled the nomads to travel far and fast. 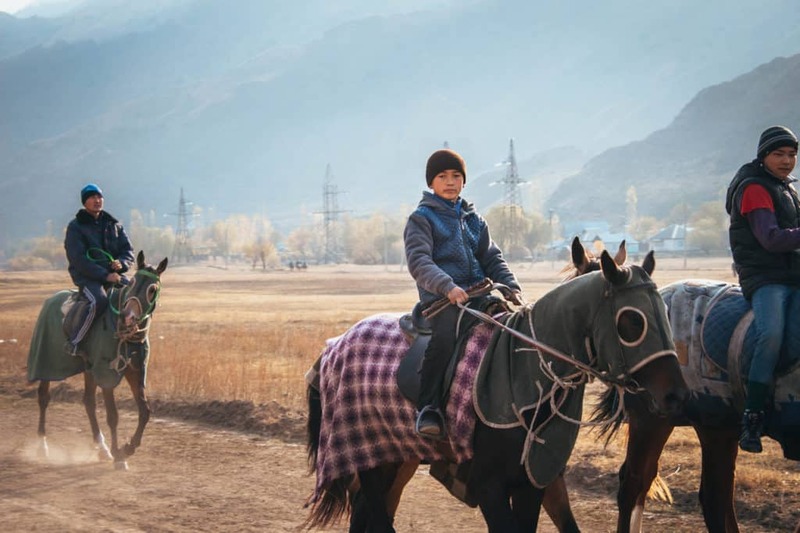 Although there aren’t as many nomadic families in Central Asia as there used to be, the horses are still very important to the people, especially in modern Kyrgyzstan where horsemanship is a much-revered skill. 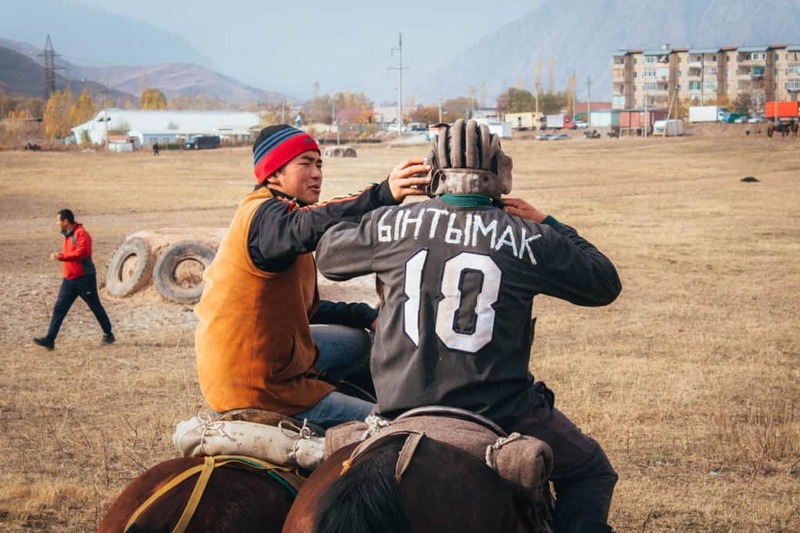 In the small towns and villages Kyrgyz boys learn to sit in the saddle before they can walk and while they grow up, they master the skill of riding. 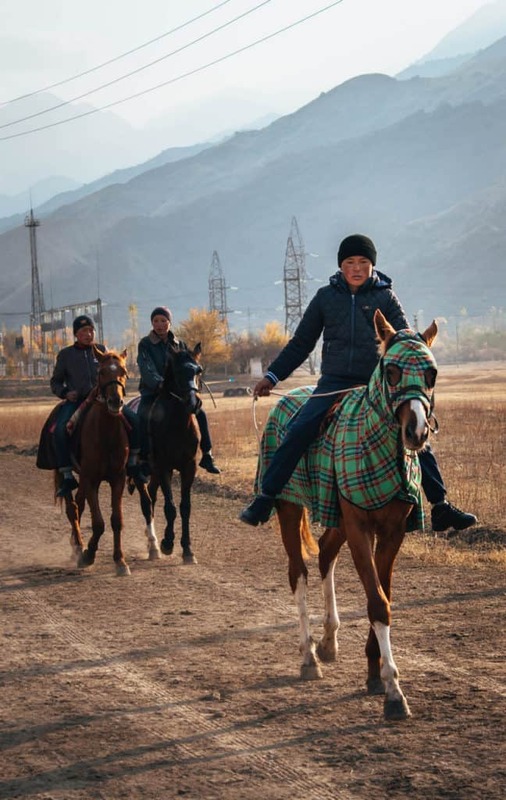 It’s hard to find a man in Kyrgyzstan who can’t ride a horse! National games and sports in which the Kyrgyz people demonstrate their equestrian skills are an integral part of the Kyrgyz culture. 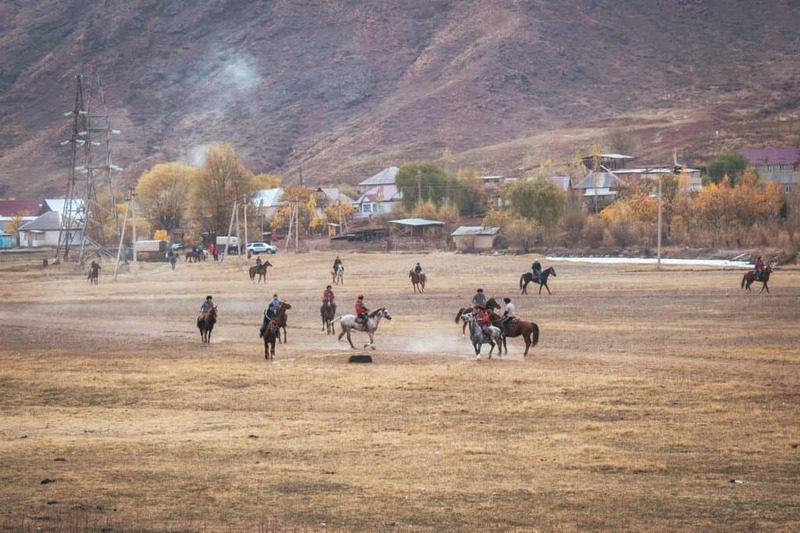 It’s very likely you’ll come across a local horse game event while you’re traveling through the country. This happened to us while we were hitchhiking from Bishkek to Osh. 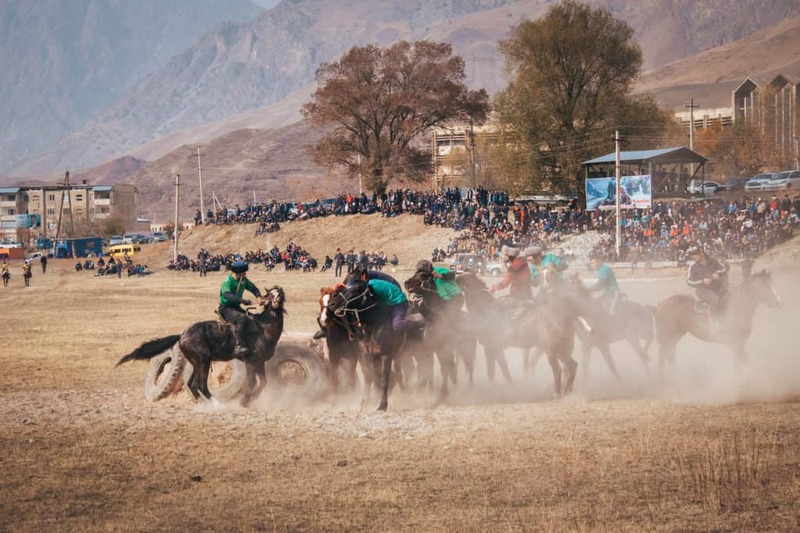 Also known as Buzkashi (Afghanistan, Tajikistan), Kokpar (Kazakhstan) and Ulak Tartysh (Kyrgyzstan), Kok Boru is an ancient honored tradition among the nomadic tribes and one of the most popular sports in Central Asia. It was even featured in the movie Rambo III in which Rambo participates in a game in Afghanistan. The history of the sport is quite interesting. One of the spectators told us that the name Kok Boru means Grey Wolf and that there are a few different versions of the origins of the game. 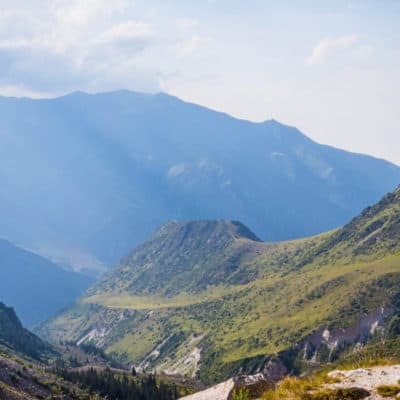 One story says that the sport was invented in the mountains by locals who saw a pack of grey wolves kill a goat and toss it around for fun. Another explanation is that the game originated from men hunting down the grey wolves that were killing their herds in the mountains. They would kill the wolf and play with its carcass by trying to take it from each other on their way back to the village. The man who could throw the dead wolf into the elder’s yurt upon arrival, would be the winner and gain the respect of his peers. 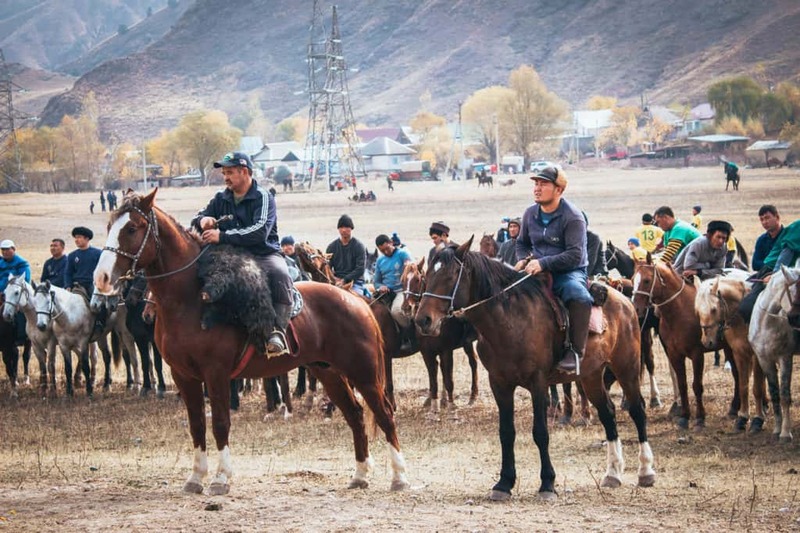 We were also told that the sport was meant to train the riders and their horses for war. When you watch the game, you’ll see that the players are constantly smashing into each other, which would also happen on a real battlefield (but in this case without weapons). Yes, it’s a pretty rough sport. I don’t think the game would be suitable for the Olympics! 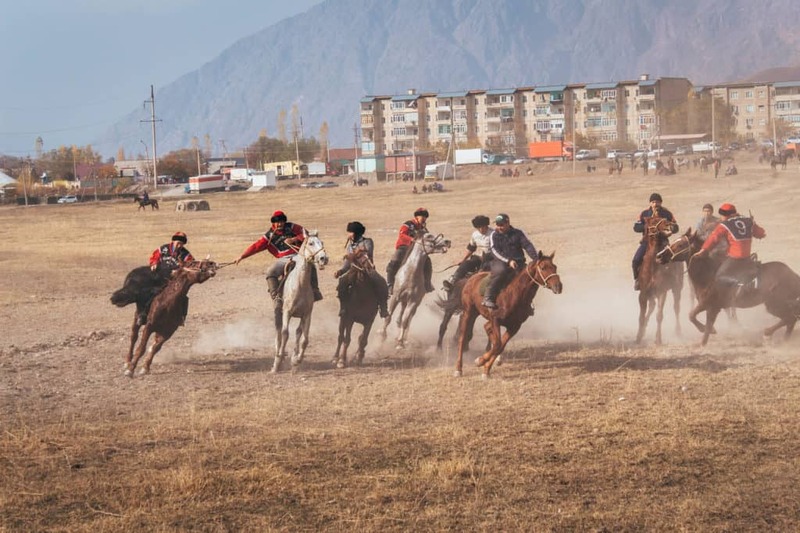 Eagle Hunting is another special nomadic tradition in Kyrgyzstan. Read more about it here. It took us a while to figure out how Kok Boru is played. 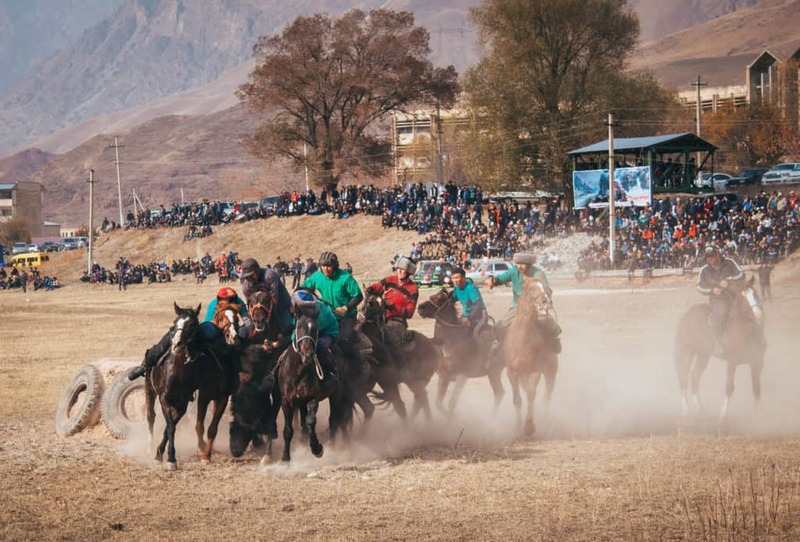 At first, all we could see was a whirlpool of dust surrounding the horses and their riders who were battling and blocking each other while trying to grab the goat carcass. After observing the match for a bit and with some explanation of a spectator, we started to get our heads around the rules and goal of the game. 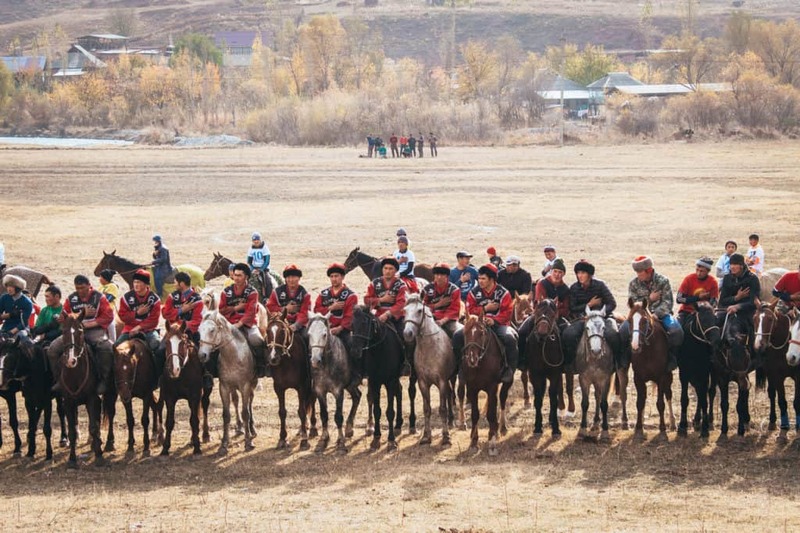 Kok Boru is played by two teams. The goal is to pick up the goat carcass from the ground, race it across the field and toss it into the center of the kazan, a ring of tires functioning as a goal. Each team has their own kazan, one at either end of the field. Every time the carcass is thrown into the kazan, the team scores a point. There are three rounds in the game, each lasting about twenty minutes. The team who scores the most during the three rounds is the winner of the game. 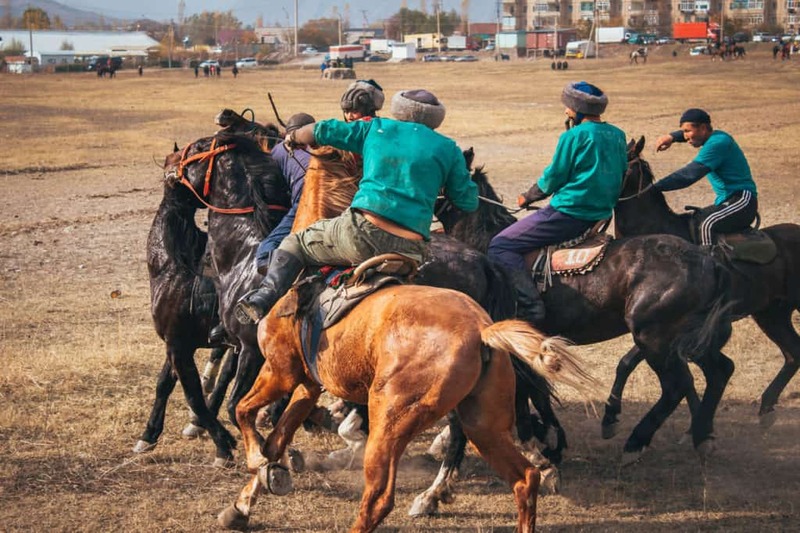 The match begins when the referee rides to the center of the field carrying the goat carcass across his saddle. 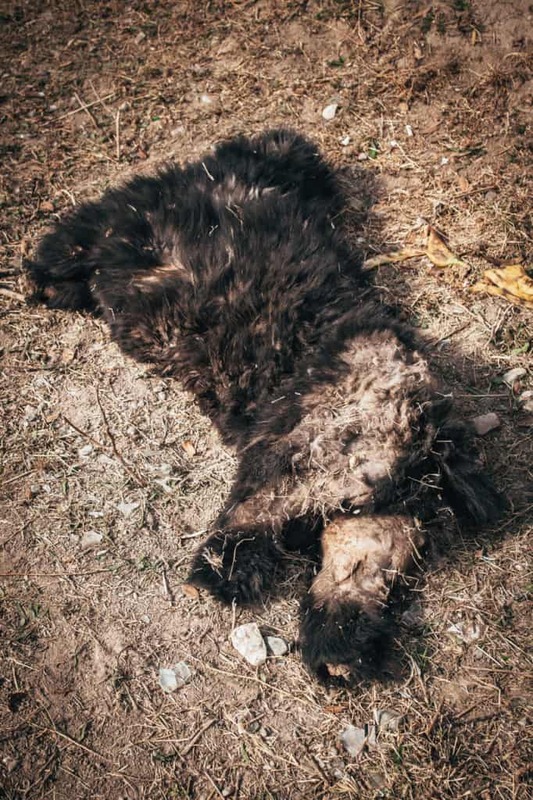 The carcass is specially prepared for the match, with its legs and head removed and the holes sewn up to prevent the blood and internal organs from spewing all over the field and the players. 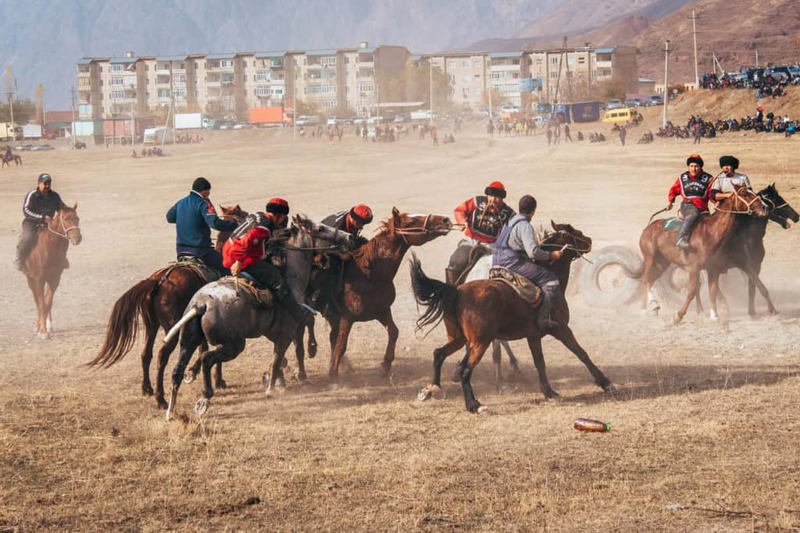 As soon as the referee throws the carcass in the center, the players of both teams– who are each waiting on their designated side of the field– race in full gallop towards the carcass. 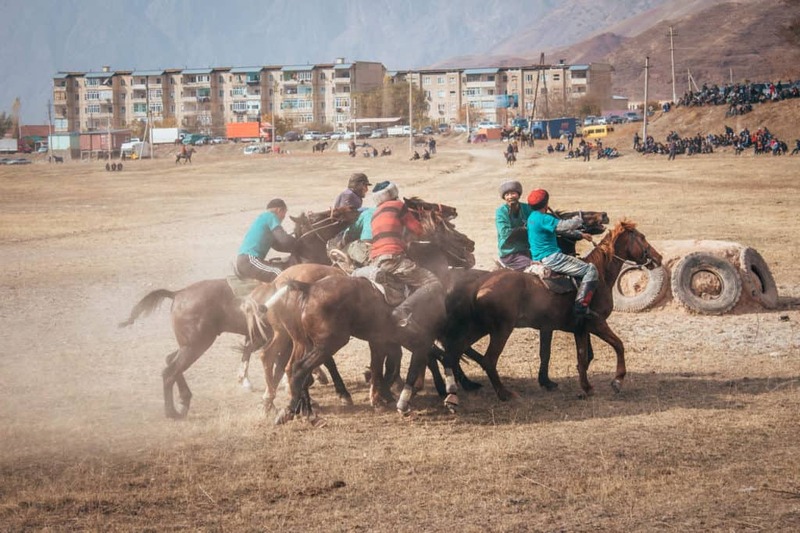 The four or five leading horses circle the carcass whilst their riders bent down and try to scoop it up. It sounds easier than it is as the teams push and shove into each other, trying to block the other team from grabbing the goat. It takes a while before one of the players manages to get a hold of the carcass and is able to pull it into his lap. It’s pretty tough on the player to lift a 40kg carcass with one arm off the ground whilst remaining seated on a moving horse that is being pushed around by other players and horses. Weightlifters at the gym can learn a few things from these guys! Once a player gets his hands on the goat, the game is back at full speed. 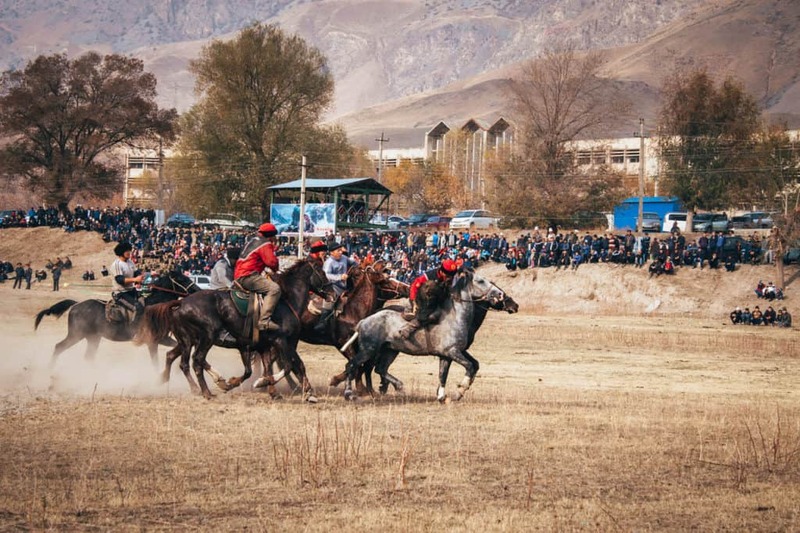 Both teams race their horses across the field while pushing, blocking and pulling the other players’ horses in an attempt to prevent the holder of the goat from reaching the kazan. The other team can also intercept the goat while the player tries to throw it into the kazan. This part of the game is intense and the players are bathing in sweat while battling to score a point. Now that’s real physical endurance! Once a goal is made, both teams return to their side of the field and restart the game until the final whistle. The players often finish the match stained in blood and mud, with thorn clothes and an occasional limp. Their performance during the game proves that they are real men and worthy of respect within their community. Niko and I watched Kok Boru with a mixture of feelings. It was fascinating, bewildering, exciting and overwhelming. I’m aware that the use of a dead animal for sport is a sensitive issue and as someone coming from a western culture, it’s definitely a controversy. However, I always try to learn more about different traditions instead of judging them. As a traveler, I find it important to visit a country with an open mind and be respectful towards different cultures. 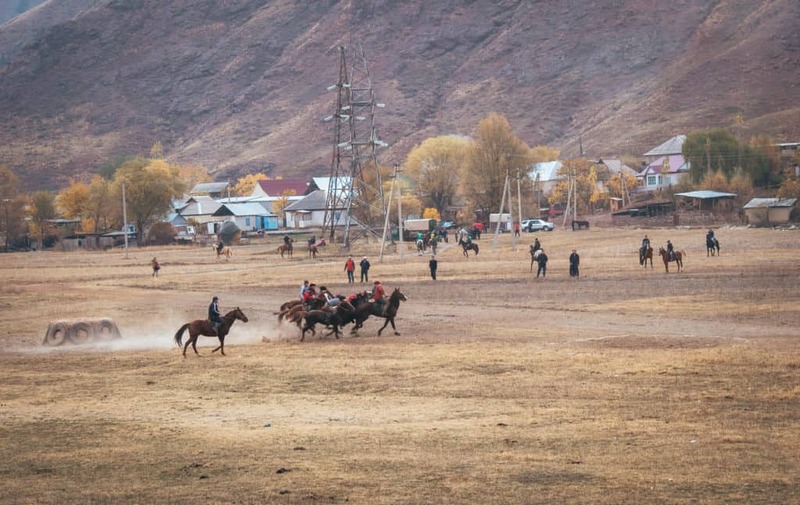 Are you interested in traveling to Kyrgyzstan? 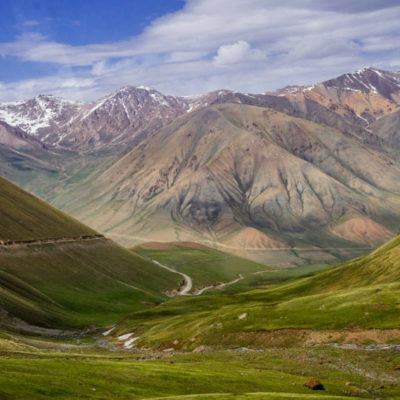 Check out our Backpacker’s Guide to Kyrgyzstan here! It can be very hard to find out where the Kok Boru competitions are held. They are organized in a very informal way and don’t get advertised. We got lucky in November arriving in the right place at the right time. Like I mentioned before, your best chance to see an authentic game is in a little town or village, where the best players live. 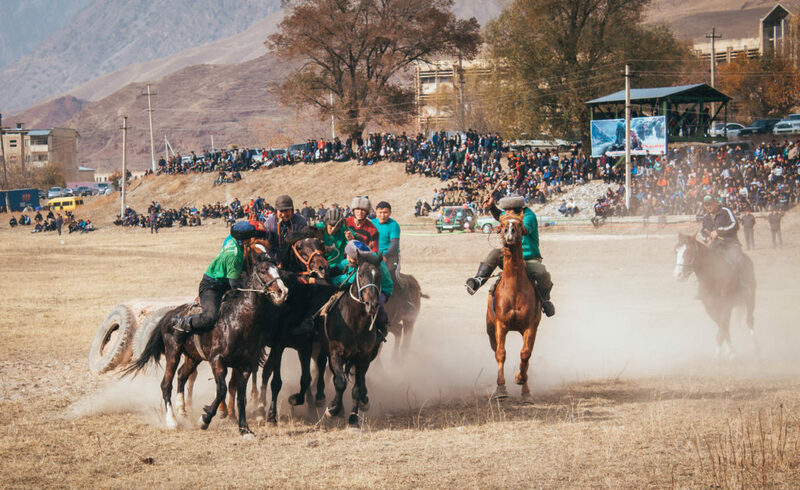 On the 31st of August (Independence day of Kyrgyzstan) and on the 21st of March (Nowruz – Spring Festival) you can watch the national championship of Kok Boru in the Pishpek Hippodrome in Bishkek. 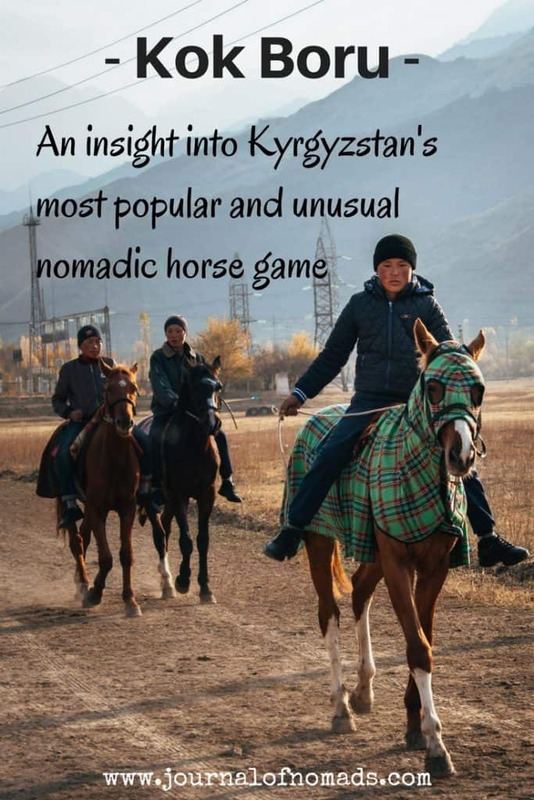 Ask about it in your hostel/ hotel when you’re in Bishkek. During the summer the CBT in Kyrgyzstan organizes a lot of independent horse festivals. Have a look at their website here. 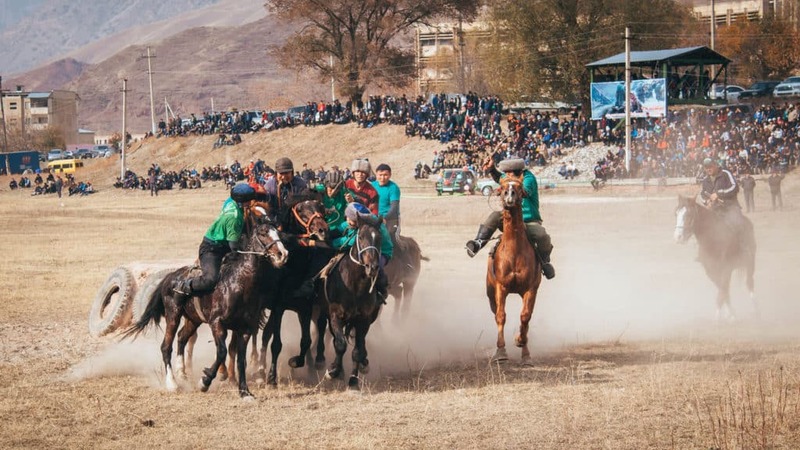 There’s also the At Chabysh Horse Festival that takes place at the Peak Lenin base camp and plenty of other National Horse Games Festivals. You can find a complete list of all the festivals and where they are held here. 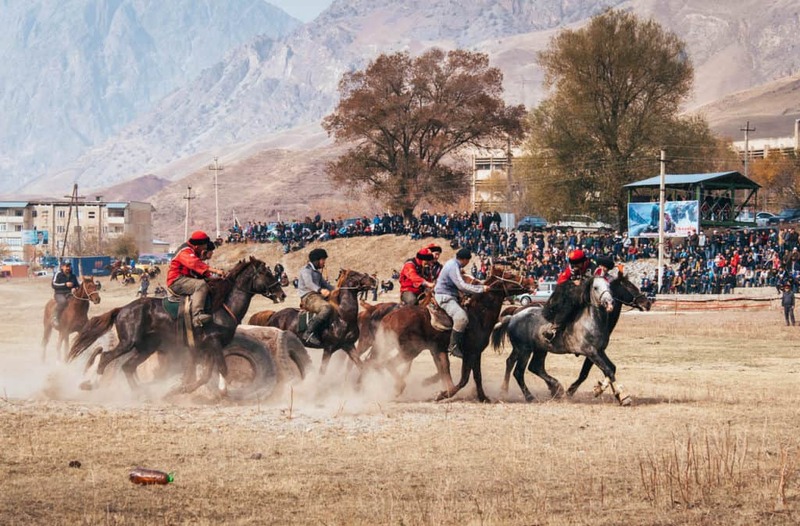 Kok Boru is the main event at the World Nomad Games. 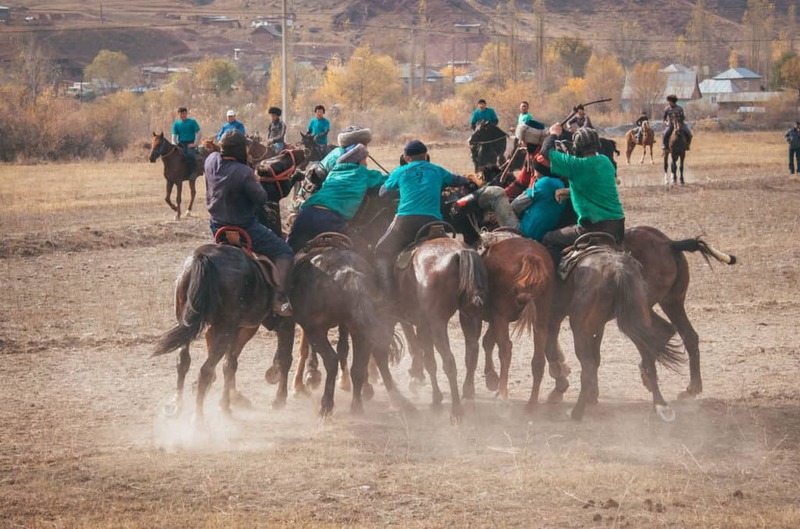 These games are held every two years in the month of September in Cholpon Apa, on the shores of Issyk Kul Lake. 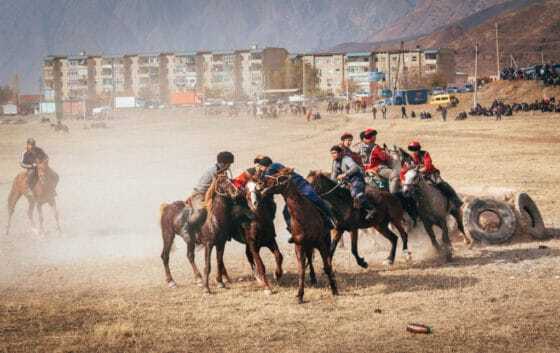 This year (2018) you can attend the World Nomad Games from the 2nd to the 8th of September. We’ll be there! More info about it here. 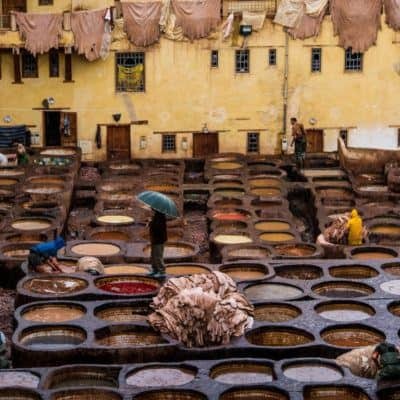 What are your thoughts on Kok Boru? Would you like to attend a sport like this? Let me know in the comments below! It’s a very interesting and intriguing game for sure! 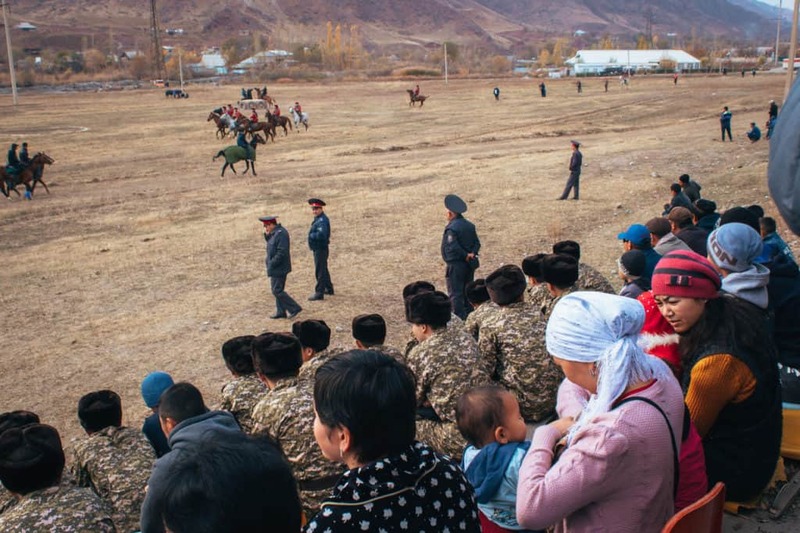 We were there as well on the World Nomad Games! What did you think about the games?